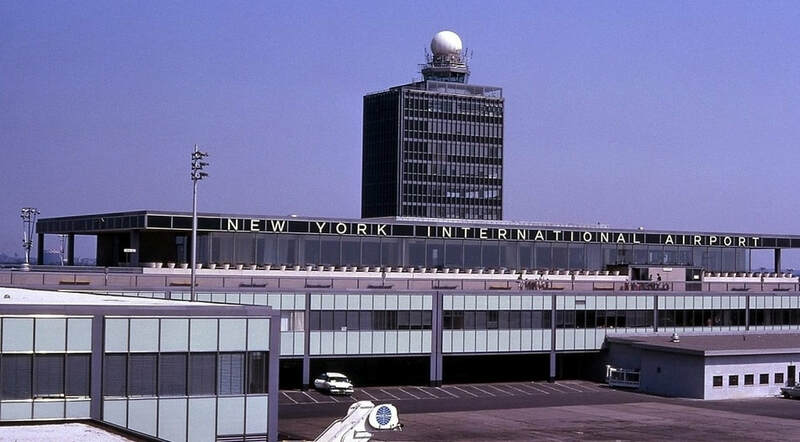 In this third installment of our multi-part history on New York John F. Kennedy Airport, we'll take a tour of the airport's first permanent passenger terminal building, the International Arrivals Building (IAB). We'll also find out how Idlewild dealt with the transition into the Jet-Age. 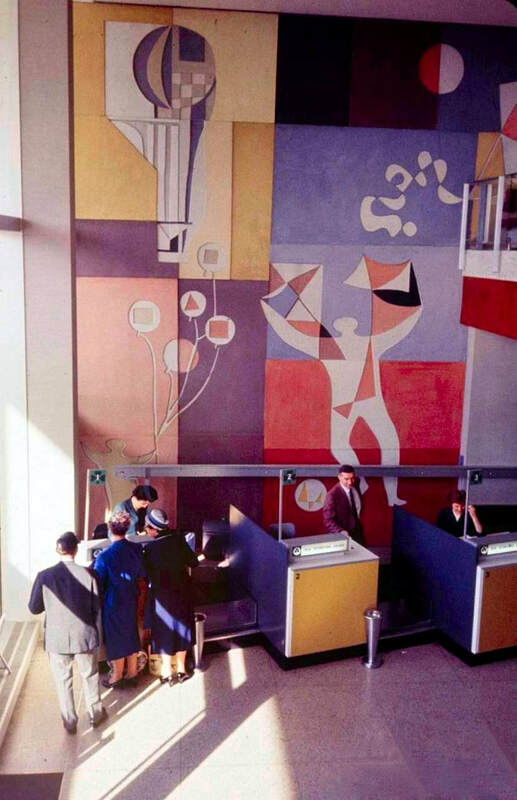 In March 1955, construction work began on the International Arrivals Building (IAB), which was completed in December 1957, after just over two years of construction. 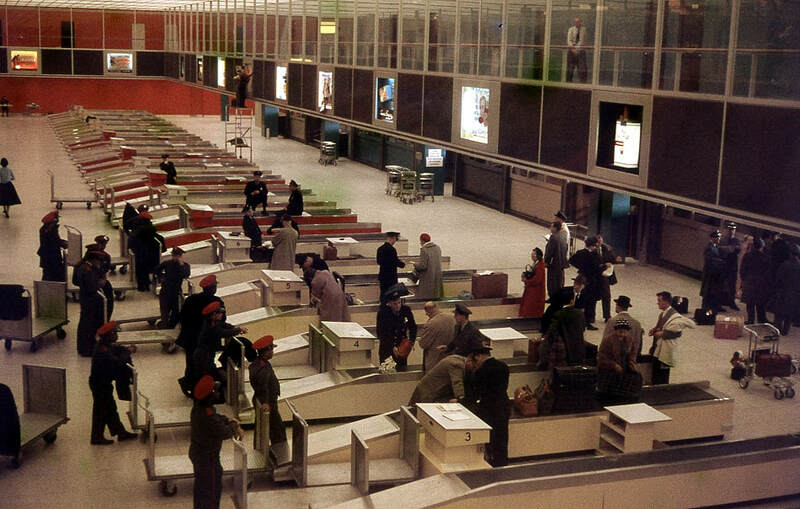 Domestic services continued to operate from the temporary terminal for many years, with airlines transferring their operations to their own proper terminals as they were completed. 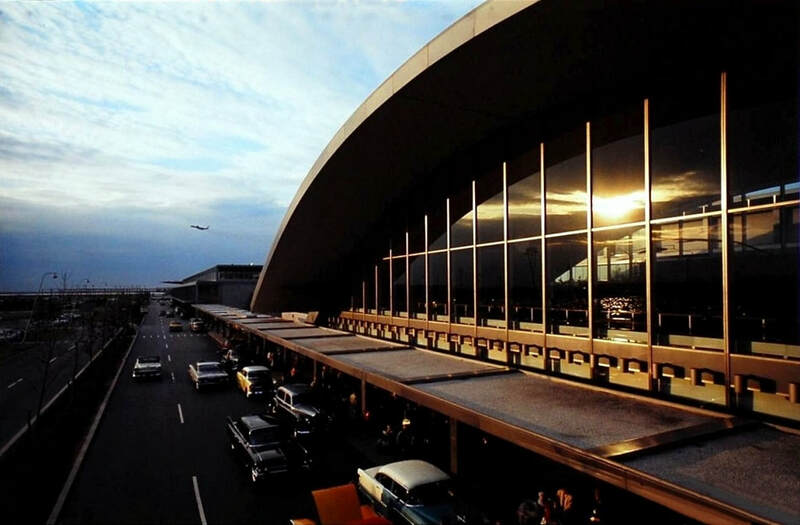 The first US airline terminals to be ready for operation were Eastern Airlines and United Airlines in 1959. American Airlines and Pan American opened their terminals in 1960 while TWA and the joint Braniff/Northeast/Northwest terminal opened in 1962. 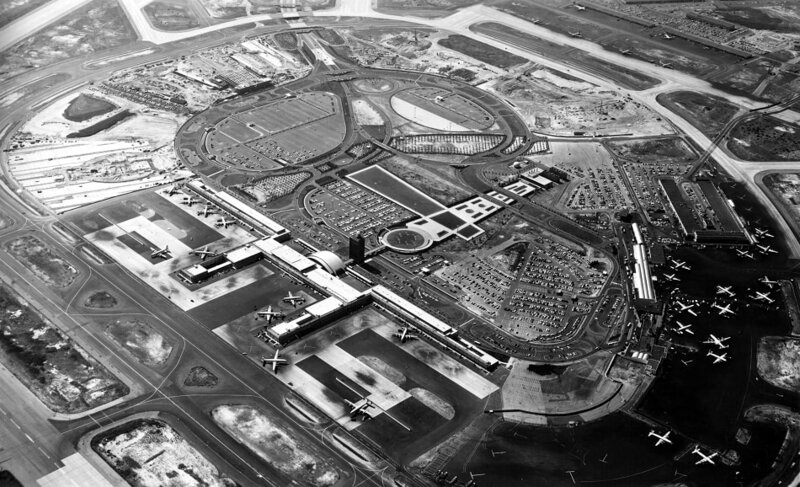 Stretching for eleven city blocks and containing nearly 600,000 square feet (55,742 square meters), the first permanent passenger terminal at Kennedy Airport was an elegant composition of three linked buildings with the central U-shaped International Arrival Building (IAB), which was flanked by two Airline Wing Buildings. Designed by Skidmore, Owings and Merril (SOM), this was the civic center of Terminal City. The parabolic arch of the arrival hall and the control tower became the airport's logo. The entire complex provided a total of 24 aircraft stands. 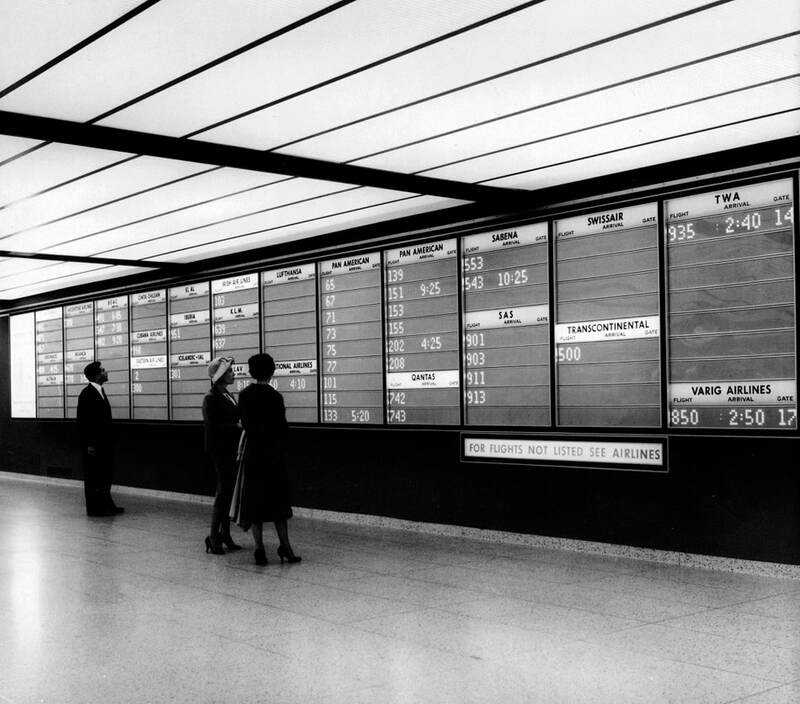 In the IAB's early days, the whole international arrival process [...] could take as little as 15 minutes. The IAB housed all Customs, Health and Immigration services and was originally used by all arriving flights requiring customs and immigration clearance. 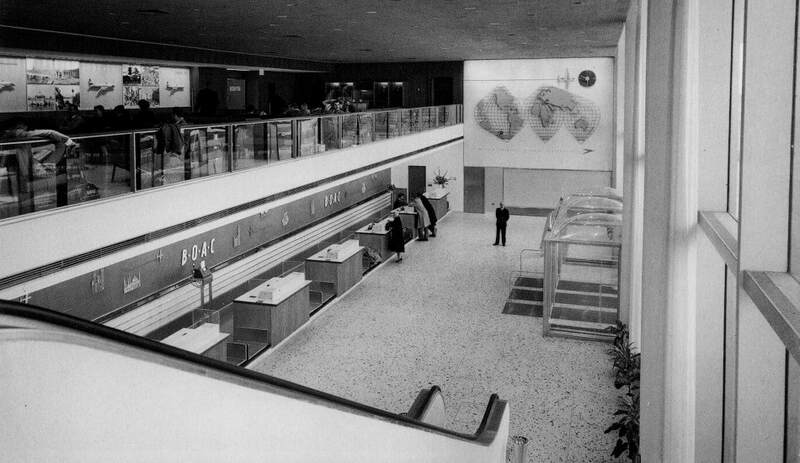 A key innovation in the design of the customs halls was the introduction of a supermarket-style clearance process whereby passengers claimed their luggage from racks and then proceeded to any of the 32 check-outs arranged in 16 pairs. Here, conveyor belts moved the bags along for inspection by the customs officers and cash registers were installed to collect any duty payable. 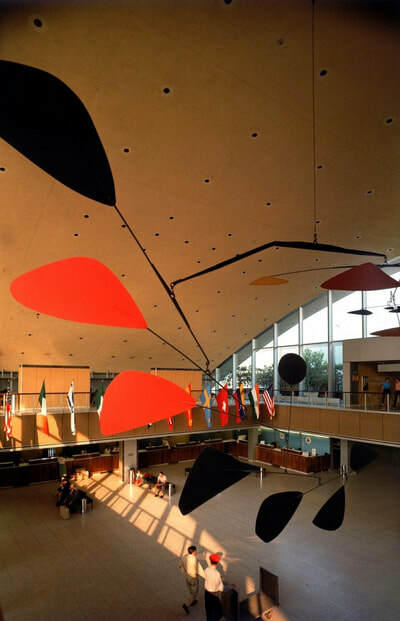 In the IAB's early days, the whole international arrival process from aircraft door to the public arrival hall could take as little as 15 minutes, compared to an hour in the temporary terminal. The IAB also contained The Golden Door Restaurant and Cocktail Lounge, a coffee shop, a barber shop, a book store, a florist shop, a jewelry store and multiple waiting rooms. 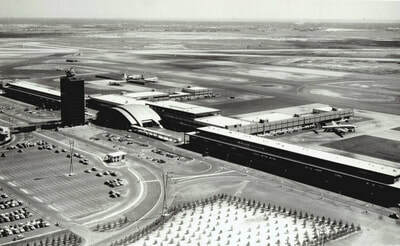 Joining the International Arrival Building at each end were the Airline Wing Buildings. The Wing Buildings housed ticket counters, lobbies and offices for the more than 20 foreign flag airlines using the airport. Each of the carrier's blocks had an attractive custom designed interior layout. There was no common departure area for departing passengers. After checking in on the ground floor, passengers proceeded to a second-story waiting room. When the flight was announced, passengers would proceed to the adjoining gate. 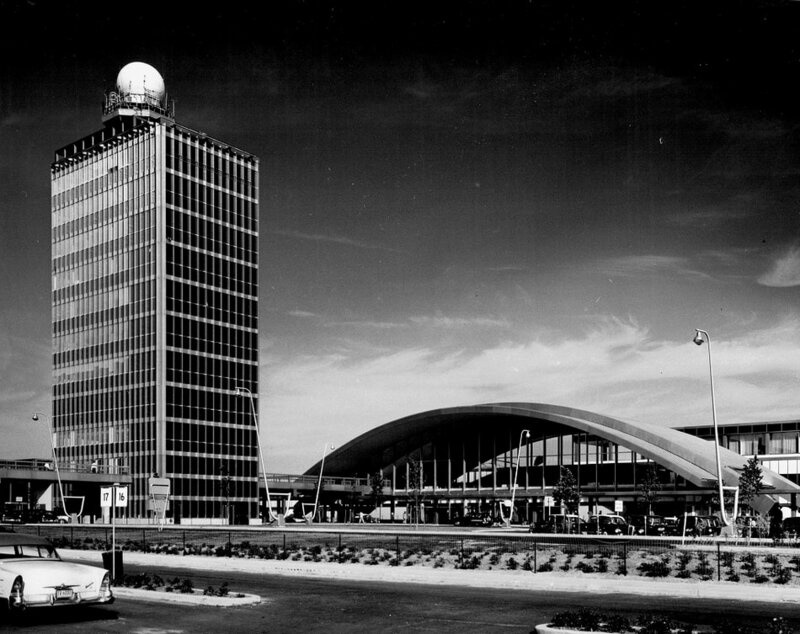 The entire length of the IAB and Wing Buildings contained a 4,000-foot-long (1,220-meter) observation deck where visitors could listen in to the conversations between control tower and aircraft by means of coin-operated radios. An elevated promenade connected the building with the public parking areas and the control tower, which had a tenth-floor observation deck. ​Having cost USD 30 million, the IAB and Wings were dedicated on December 5th, 1957, and operations started in the early hours of the next day. The honors for the first arrival went to a B.O.A.C. Douglas DC-7 from Nassau, while the first transatlantic arrival was a Pan American Boeing Stratocruiser from London. The IAB and Wing Buildings were later renamed Terminal 4. The 'Jet Age' presented a huge paradigm shift in air travel. Jet airliners were able to fly much higher, faster and farther than older piston‑powered propliners, making transcontinental and intercontinental travel considerably faster and easier. For example, aircraft leaving North America and crossing the Atlantic Ocean (and later, the Pacific Ocean) could now fly to their destinations non-stop, making much of the world accessible within a single day's travel for the first time. ​Since large jetliners could also carry more passengers than piston-powered airliners, air fares also declined (relative to inflation), so people from a greater range of socioeconomic classes could afford to travel outside their own countries. ​Terminal City opened just as the Jet Age began in the United States. 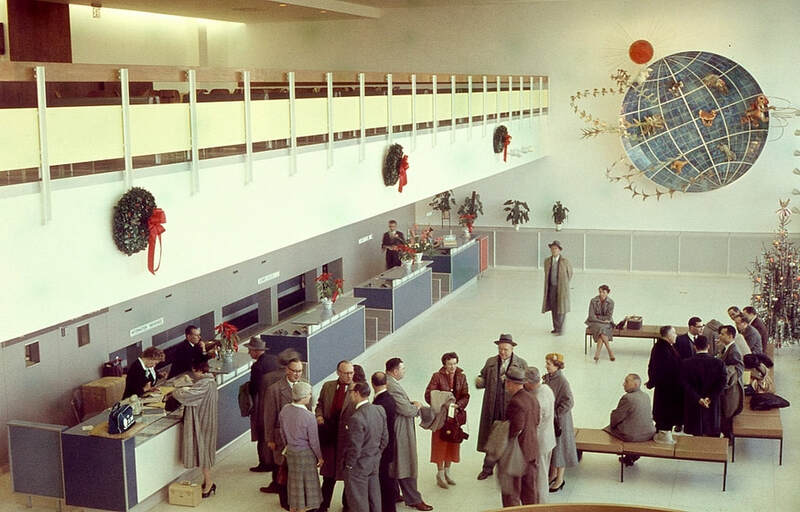 Idlewild was not the first Jet Age airport. Neither the British-built Comet 1 nor the Russian Tupolev 104 served the airport when first entering service in the 1950s. 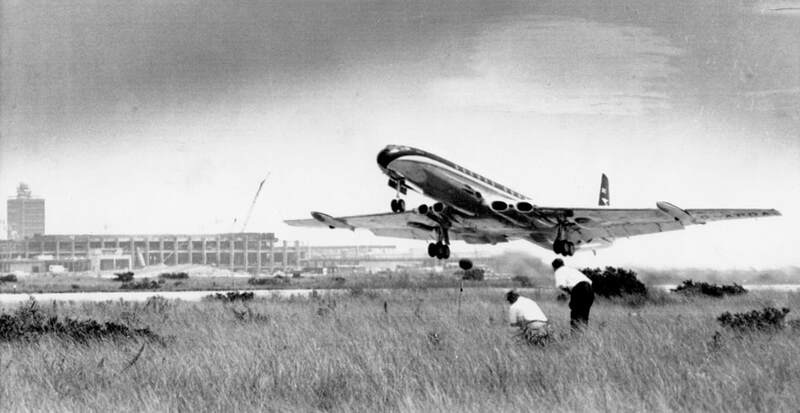 However, the first truly successful jet airliner, the Boeing 707, entered passenger service at Idlewild. 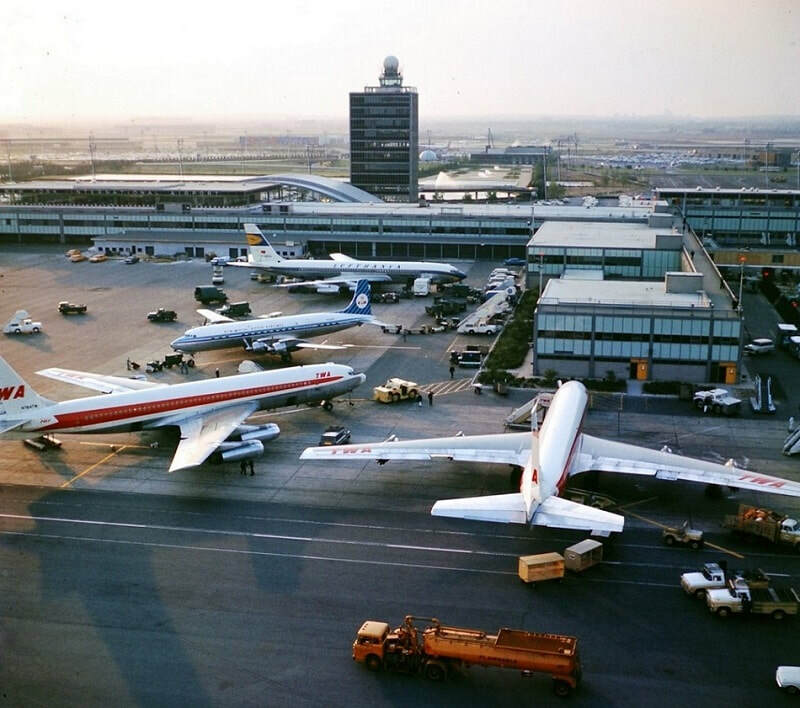 New York International Airport truly became a true jet age airport as the first generation of Boeing, Douglas and Convair jet airlines entered service, starting in 1958. In August, 1958, Pan American began operating experimental 707 cargo flights to San Juan, Puerto Rico. Later the same year, the first regularly scheduled jet-powered trans-Atlantic flights began when the Comet IV entered into service on the British Overseas Airways Corporation's (BOAC) route between Idlewild and London Heathrow, on October 4th. 12 days later a Pan American 707-121 flew a press demonstration flight from Idlewild to Brussels. On October 26th, Pan American started its first scheduled international flight using the 707, when Flight 114 departed Idlewild for Paris Le Bourget Airport. By 1959, the Boeing 707 and Douglas DC-8 became a common sight at Idlewild. On January 25th, American began service to Los Angeles. 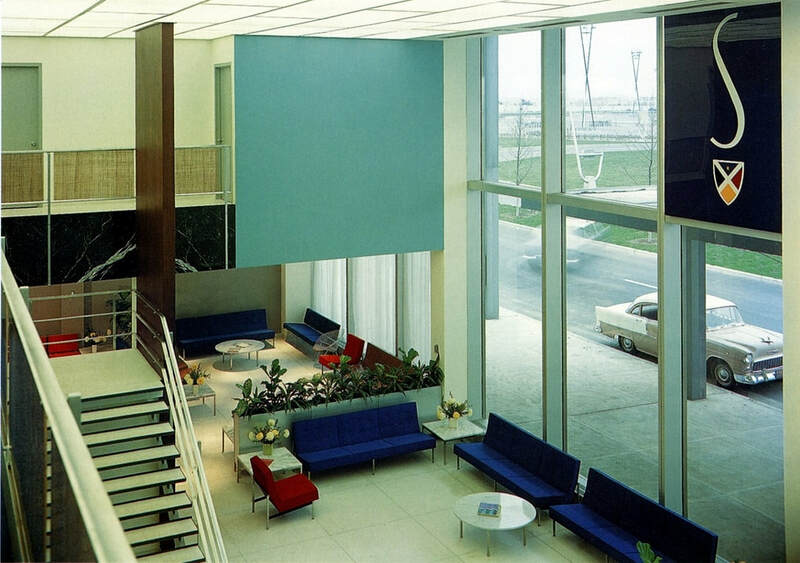 On March 20th, TWA began 707 service between Idlewild and San Francisco. Boeing's main competitor, the Douglas DC-8, also made its commercial debut at Idlewild when the type entered service with Delta and United. ​On September 18th, Delta inaugurated service to Atlanta. 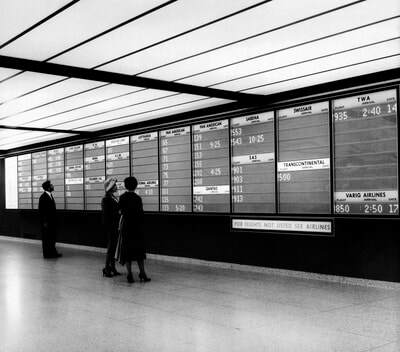 United's first DC-8 flight arrived from San Francisco a few hours later. By 1960, the jet age was well underway and all of the major US carriers were operating jet airliners. 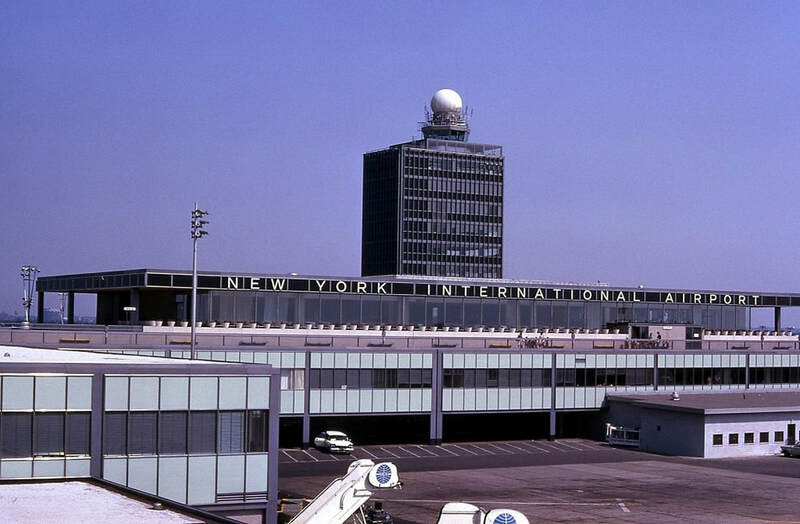 New York's stature as the United States' largest and most important city usually dictated that that airlines--both domestic and foreign--used new aircraft types on Idlewild routes. ​By the early 1960s, 707s and DC-8s belonging to the major European Airlines became a common sight. ​Introduction of commercial jet service was hampered by noise, runway length and aircraft range problems. Idlewild's runway 25, the preferred runway for the departure of jets, was too short for the 707 and DC-8 to take off with a full load of passengers, cargo and fuel. Runway 13R-31L had enough length, but due to noise abatement procedures, departing aircraft were required to make early turns, which limited the loads. ​By 1960 two runway (7-25 and 13R-31L) had been extended and a new runway, (4R-22L), built in 1959, became the primary Instrument Flight Rules (IFR) runway. 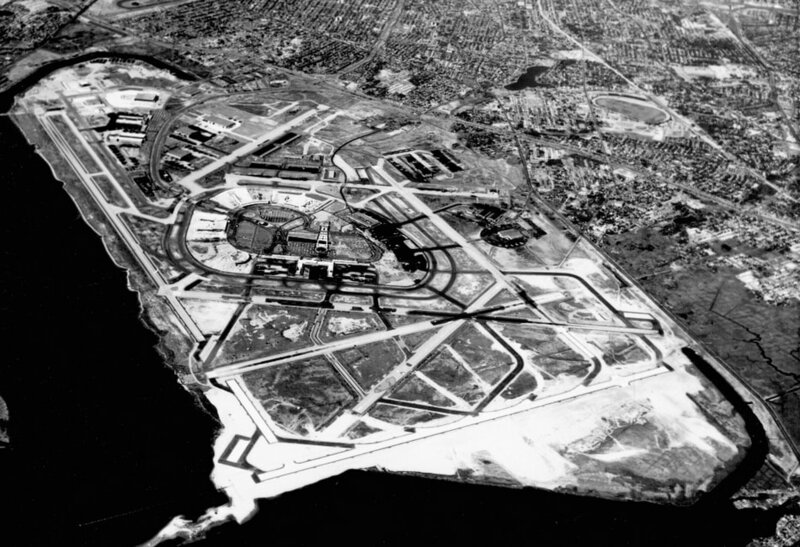 Runway 1-19, restricted to propeller operations and no longer useful, was closed in 1961. The Boeing 707 and DC-8 programs were launched only days before construction started. Originally, these planes could seat approximately 120-130 passengers in a two-class configuration. 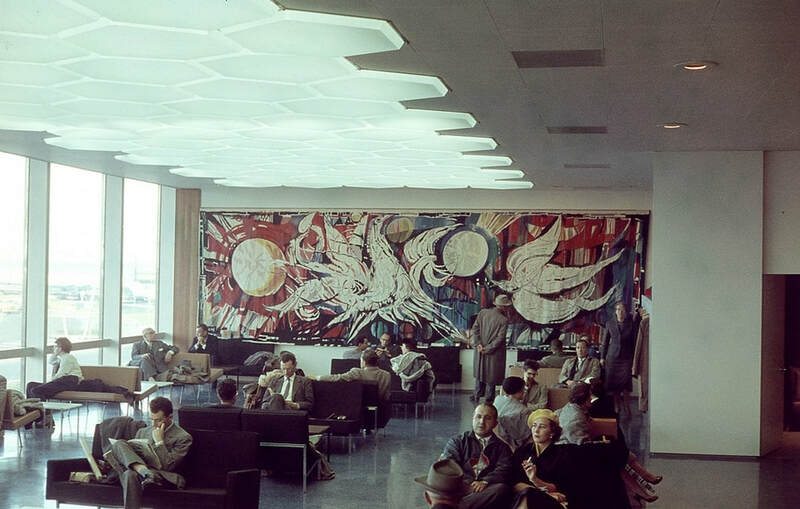 ​During the 1960s this number increased through elimination of the lounges, reduction of first class, and most importantly, by the introduction of economy class. 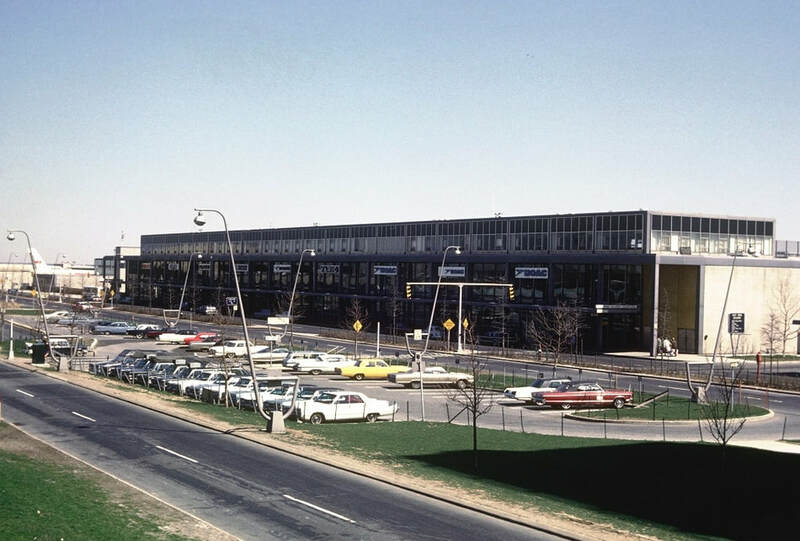 The combined effects of these developments saw the average number of passengers per international arrival more than double from 40 in 1957 to 93 in 1960. For the IAB to cope, the customs and baggage handling facilities were expanded, thereby boosting the international arrival capacity to ten big jets, or 1,200 passengers, per hour in time for the summer season of 1961. Blast fences were installed to protect the Wing Buildings and allow jet aircraft to taxi out under their own power. 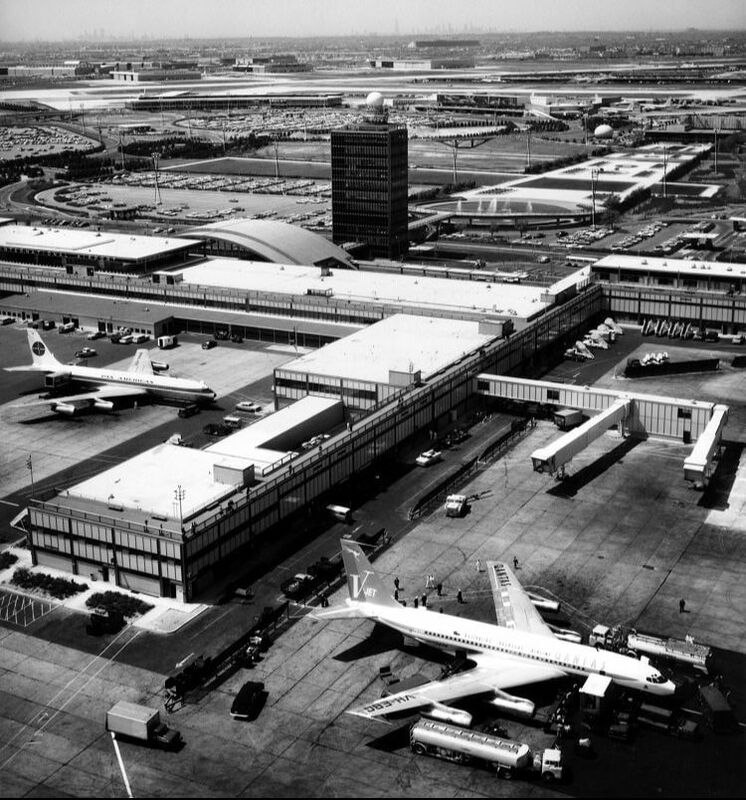 A short pier with two boarding bridges was built on the outer side of the eastern arm of the "U" and leased to BOAC. A second one was planned for the use of Air France but was never built. We have merely set the stage. 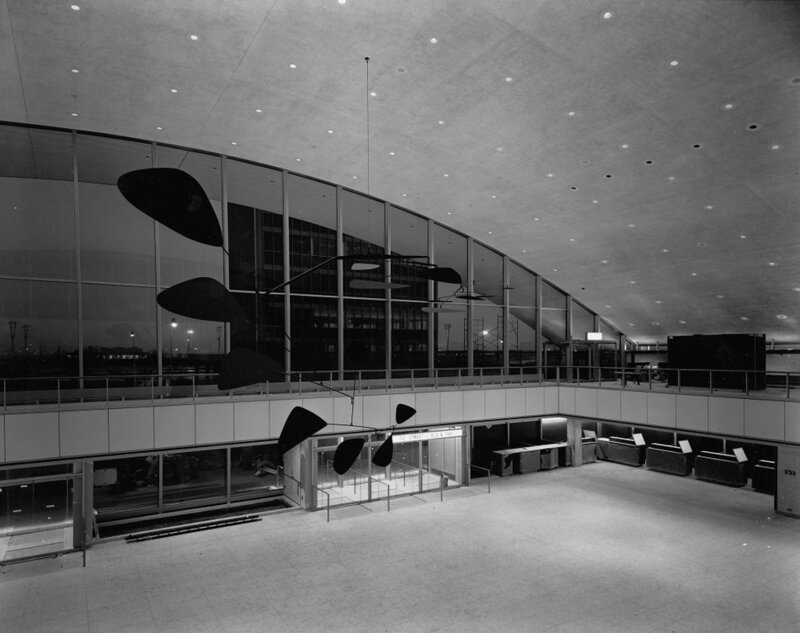 In the coming parts, we will explore the early airline terminals of Terminal City that opened from 1959 to 1962, including the legendary Pan Am Terminal and TWA Flight Center! 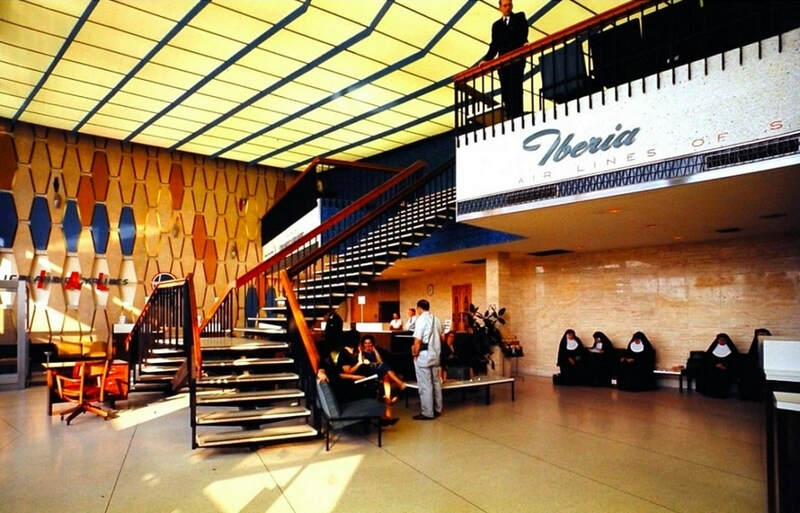 Do you have memories of Idlewild in in the early years? Share your memories below! ​Do you have any interesting information or images to share that can help improve this article? Drop me an email.